As the cigar’s name alludes, Alec Bradley Black Market Esteli turns the focus towards Nicaragua’s most famed growing and cigar-producing region of Estelí. Since the original cigar’s debut in 2011, Black Market has long been among Alec Bradley’s best-selling brands, delighting cigar enthusiasts with its unique blend and full-bodied flavor profile. 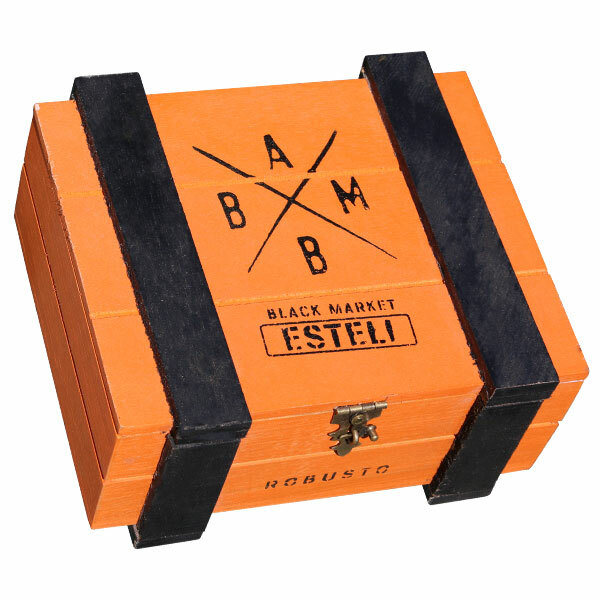 While the original Black Market showcased a diverse, multinational blend of 4 countries, Black Market Esteli narrows its scope, focusing solely on Central American tobaccos of Nicaragua and Honduras. In the modern cigar scene, Nicaragua is the mecca of premium cigars, and Estelí is the cigar-producing mecca of Nicaragua. The city is known for producing the most potent, intense and high-octane tobaccos throughout Nicaragua; and with Black Market Esteli, Alec Bradley fine-tunes the smoking experience to best showcase the unique flavor properties of Nicaraguan Estelí tobacco. Alec Bradley Black Market Esteli features a similar, medium-full body from the original Black Market cigar. The updated blend includes a Nicaraguan wrapper, a double binder of Nicaraguan and Honduran varietals, and an all-Nicaraguan filler blend. The cigars feature dependable construction and big smoke output, showing a fiery profile of freshly crushed black peppercorns, earth, dark chocolate, espresso, and chili powder.